I'm in the blue; Bernie is holding Ms. Antsy Pants. photo by Bow Brickhill Stables. If you've been with AWIP for a while, you know what a "learning junkie" I am. I overdose on DVDs, clinics, my magazines/books and equestrian TV/video subscriptions. 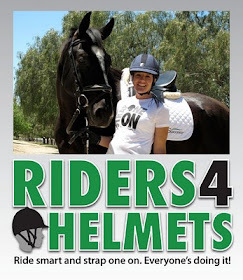 One of my favorite learning tools for more than a year now has been Bernie Traurig's EquestrianCoach.com. 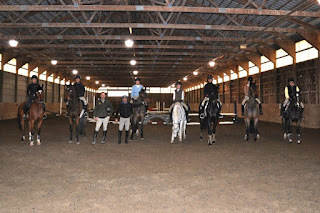 One of my equestrian highlights from early 2012 was the opportunity to audit one of Bernie's clinics at Mary Babick's Knightsbridge Farm in Atlantic Highlands (Day One and Day Two reports). 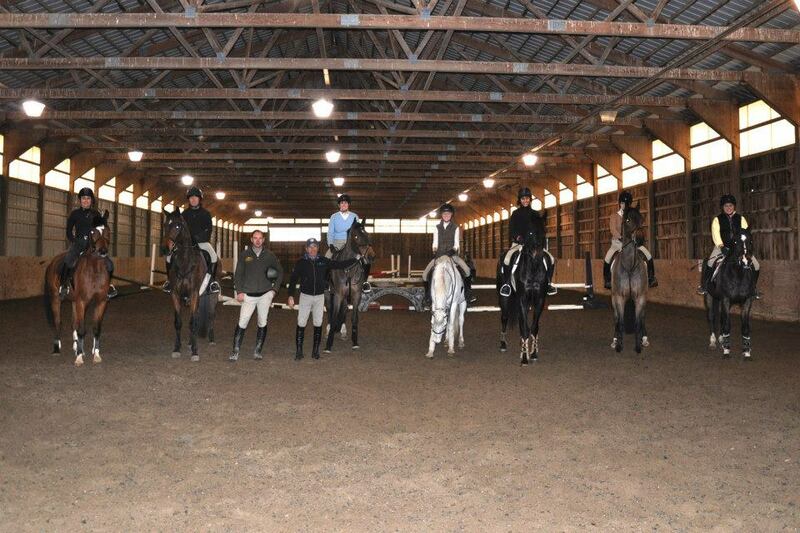 So when I learned Bow Brickhill Stables in Milford, NJ, was holding a clinic with Bernie, you can bet I jumped at the chance to ride in it. My blogging buddy Marissa and her boy Tucker (of Tucker the Wunderkind fame) joined me as clinic participants. More importantly, they were our ride over to Bow Brickhill! (Sadly, I am trailer-less.) This is an ideal situation as 1) Marissa and I have a total blast together, 2) Tucker has a HUUUUUGE crush on Sugar and 3) Tucker (the poor besotted creature) lets Sugar eat all his hay, which makes Madame Mare very happy. We had a brief panic attack two weeks before the clinic when Sug presented with fatigue and lameness, but a quick call to our vets, B.W. Furlong & Associates soon put things right. Dr. Furlong thought Sugar most likely had Lyme's disease so we put her on a course of Doxycycline and lo and behold, a few days later she was in fine form again. Phew! Prior to the clinic the Sainted Mare was primped and foofed, and all my tack, jumping boots, saddle pads, wraps, polos, breeches, and pretty much damn near everything I owned was cleaned and laundered within an inch of its life. The Friday night before the clinic I set out my wardrobe for both days - breeches, sweaters, UnderArmour, belts, my comfiest sports bra and undies (very important!) and my lucky socks. I set my alarm clock and I made my husband set his, which he was none-too-happy about. Turns out all that alarm setting was unnecessary, as I didn't sleep a wink and was up long before the alarm could go off. Ummm, nervous much?? The kids finally meet Tucker! Marissa and Tucker picked us up at our barn and Tucker was clearly thrilled to see his girl again. I loaded Sug on the trailer and Tucker made googly eyes at her while she proceeded to tear into his haybag without so much as a "Hi, how have you been?" 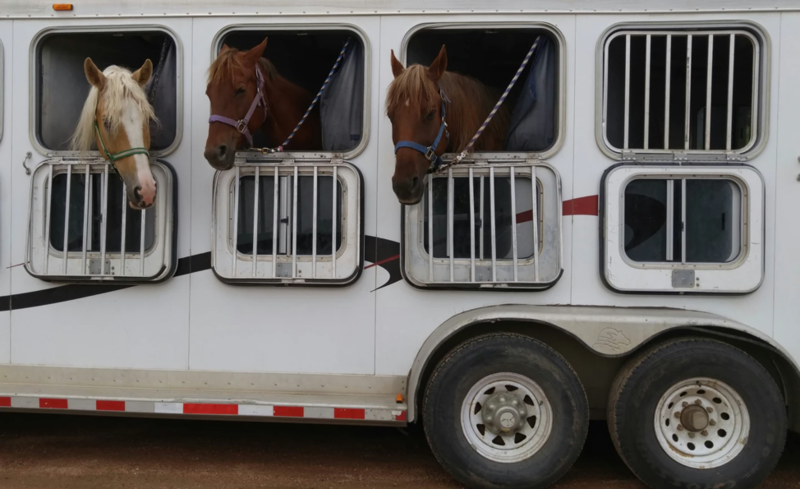 We loaded my stuff and headed off in high spirits - two girls and their horses in search of a good time. The high spirits lasted for about 10 minutes until we got to the end of the road and I realized I'd forgotten my boots! Cue emergency turnaround in local elementary school followed by sheepish return to barn, panicked search for tall boots, and eventual return to the road almost half an hour behind schedule. A pox on you, Mr. Murphy, and your bloody law. We got to Bow Brickhill, unloaded and tacked up in a lather. Thankfully we made it to the ring on time to get kitted out with our wireless headpieces. I'd never ridden with these before, and found them to be a right nuisance. No doubt it was my inability to adjust them properly, but they kept bobbling about and distracting me, especially as I was jumping, but when they stayed in they did make it easy to hear what Bernie was asking us to do. Bernie started with introductions and a tack check, making sure our tack was appropriate and correctly adjusted. He noted that Sug wore a figure eight noseband and asked why (Answer: Because she can get strong over fences and open her mouth) and that she wore a full cheek Dr. Bristol snaffle (for extra control while turning). He noted what everyone else wore and then sent us out on the rail to warm up. This is getting long and, quite frankly, I need to speak with Marissa before I go into more detail. Seems that I was so busy trying to do what Bernie asked us to do that I don't actually remember any of it or why we were doing it in the first place! Aaack, senior moment! More to come at some point. It's hard to remember it all!